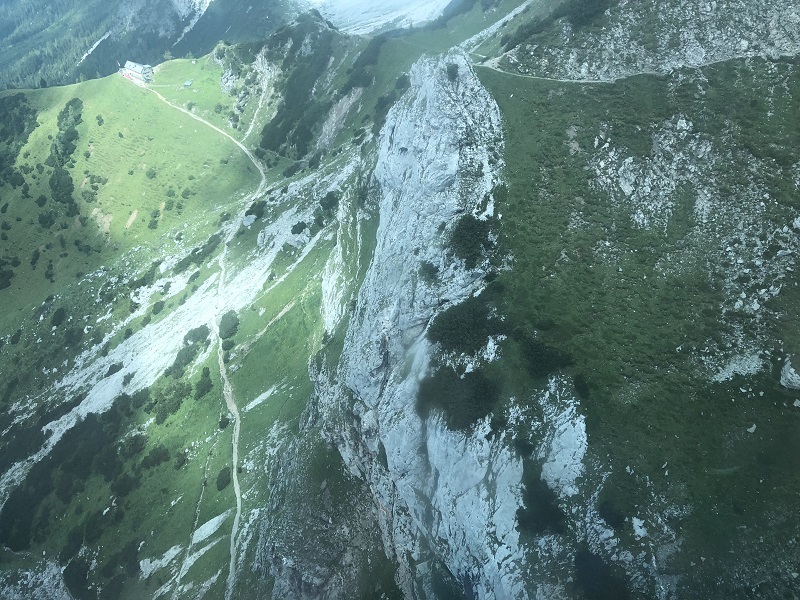 Dachstein – the view from above. 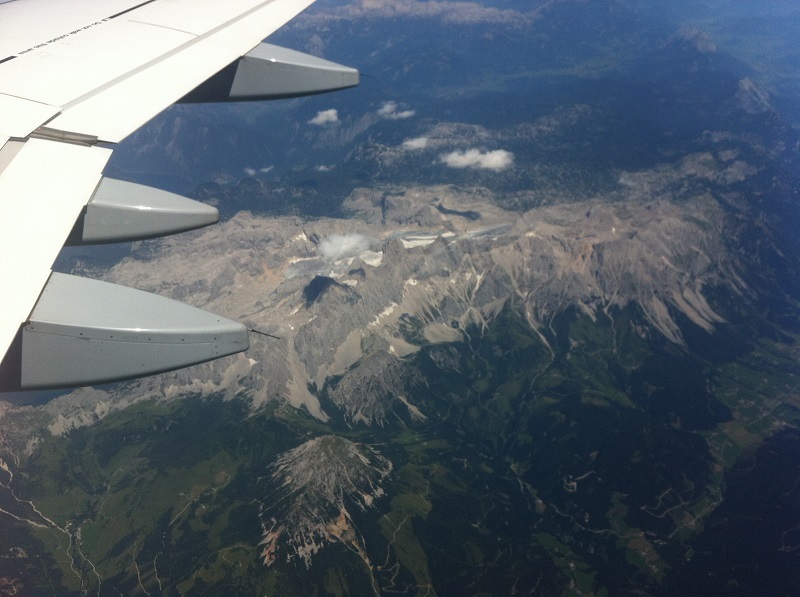 In 2015 I recognized the area from a Lufthansa airplane that flew from Sarajevo to Munich. First I thought it was Scheichenspitze but after closer research I saw it was Hoher Dachstein. In the end of July 2018 our Magazine visited Austria. 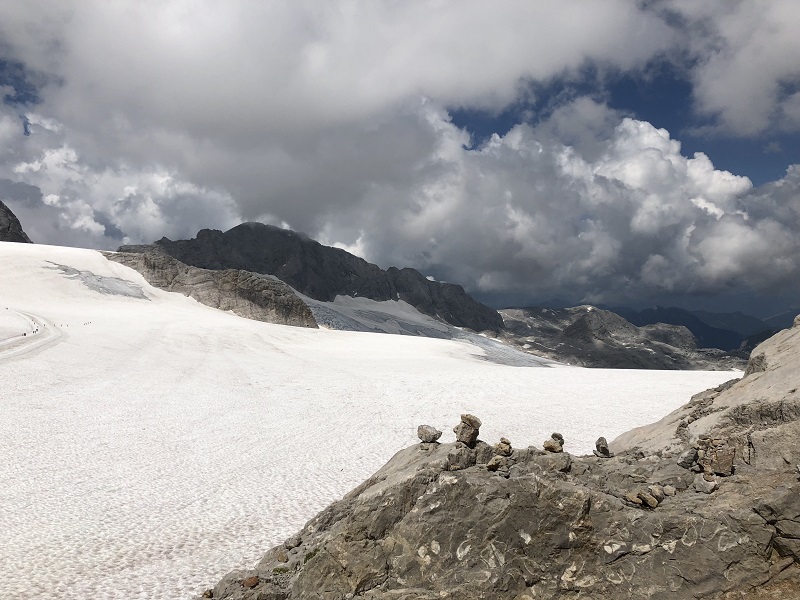 We decided to take a closer look at Dachstein, (Hoher Dachstein). In the period of last 20 years I have passed through that area with car around 20 times and every time I felt great. Is it because of all those mountains? Probably is that one of the reasons. 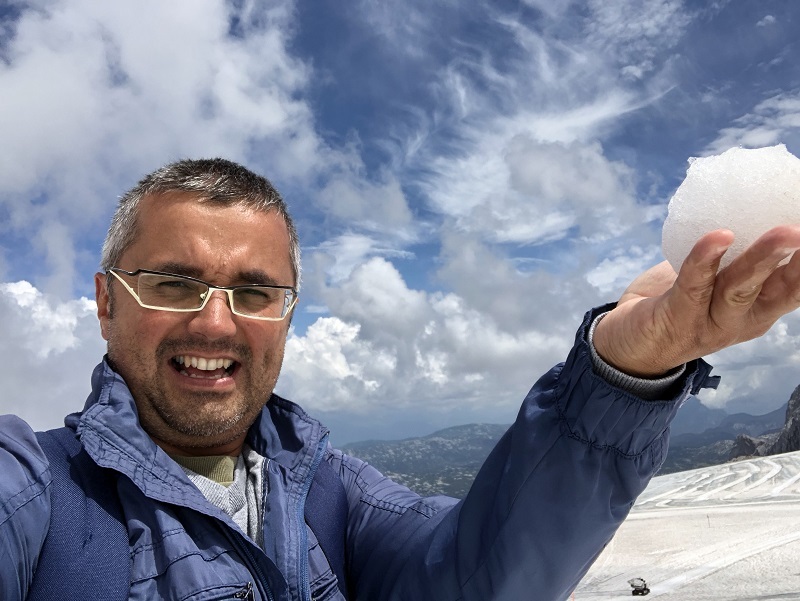 Snowball at glacier at Hoher Dachstein: Imagine playing around in show in the middle of the summer. Great but wet because of melting snow. In 2015 I recognized the area from a Lufthansa airplane that flew from Sarajevo to Munich. First I thought it was Scheichenspitze but after closer research I saw it was Hoher Dachstein. But Scheichenspitze (a lower top) is not far away anyways and should be visible on the image below. In 2015 I recognized the area from a Lufthansa airplane that flew from Sarajevo to Munich. 2995 meters above the sea level. Very nice mountain. We left the Autobahn A10 from Villach towards Salzburg and turned to the right. We continued driving towards Radstadt, Schladming and Graz. In Schladming we turned to the left and came to our pension called Concordia. It was high up in the mountains with very nice view all around. Mountains close to Ramsau am Dachstein where we found our pension Concordia. 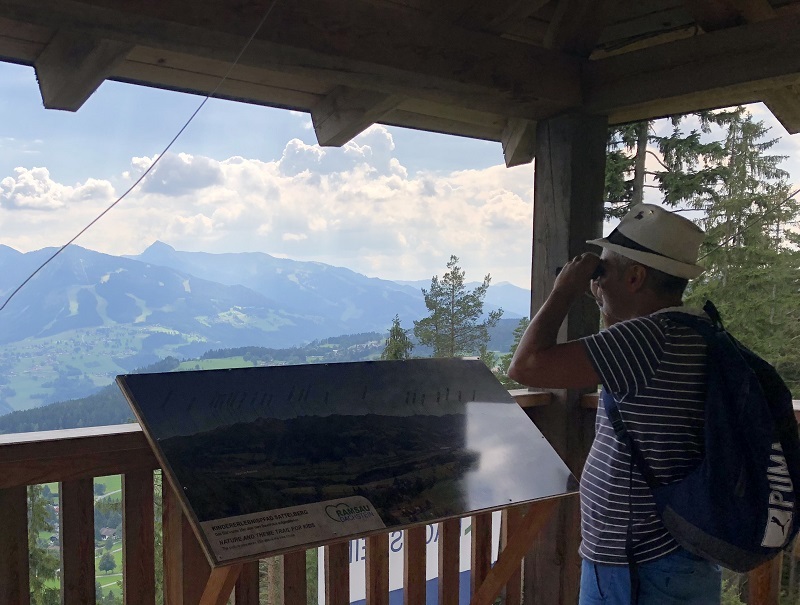 Great view over the Schladming area. Perfect for ski lovers. Since our pension was close to Ramsau am Dachstein just below the great Dachstein we decided to visit that place. There are many attractions and restaurants. It is visible that Austria care about their tourism. Ramsau am Dachstein in Schladming-Dachstein is an 18 km long, 4 km wide plateau at an altitude of 1,000 to 1,300m. It is not only for skiing great. Especially for Nordic ski sports it is one of the best destinations in the Alps. 220 kilometers of cross-country skiing tracks, created in 13 different loops in various levels of difficulty, length (up to 30 km) and altitude. 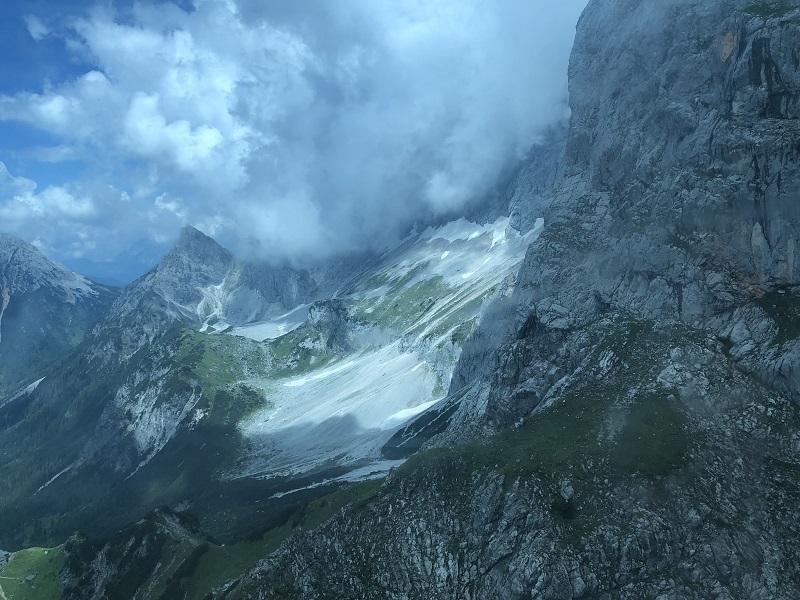 It is possible to reach the top of Dachstein by climbing or walking up and by taking gondola that starts from a lower part of this mountain. In Gondola to the Hoher Dachstein there is room for 60 persons. The trip up to the top takes a few minutes only and the view is very pleasant. 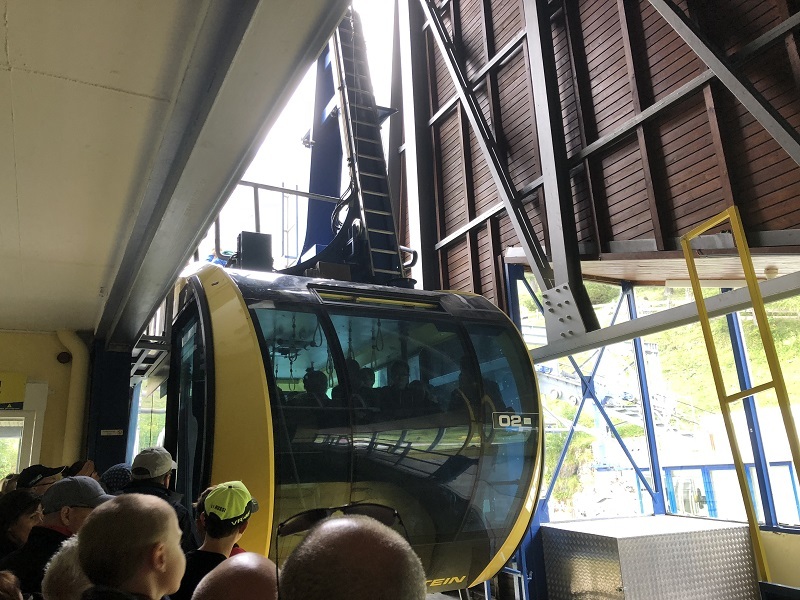 In one gondola there is room for 60 persons. The trip up to the top takes a few minutes only and the view is very pleasant. Sometimes it can be a transition from sunny weather into a deep fog. Even though the gondola is surrounded by fog or clouds it is possible to see cliffs and ice or snow during the tour upwards or downwards. Great view from gondola. Some minutes after leaving the start position we already could feel some excitement looking forward reaching the top. Gondola, summer and snow. Some minutes after leaving the start position we already could feel some excitement looking forward reaching the top. On the top the weather easily can shift and suddenly there is a perfect sunny day but with only 5-6 C degrees. That is cold comparing to 25 C degrees on the bottom of the mountain. Glacier, sunshine and only 5-6 C degrees at the top. We can see people walking around and exploring the place. It looks like some arctic expedition. We visited some interesting points. Treppe ins Nichts or Stairway to Nothingness is one of them. The view is great and it is easy to recognize places like valley with attractions close to Ramsau am Dachstein. 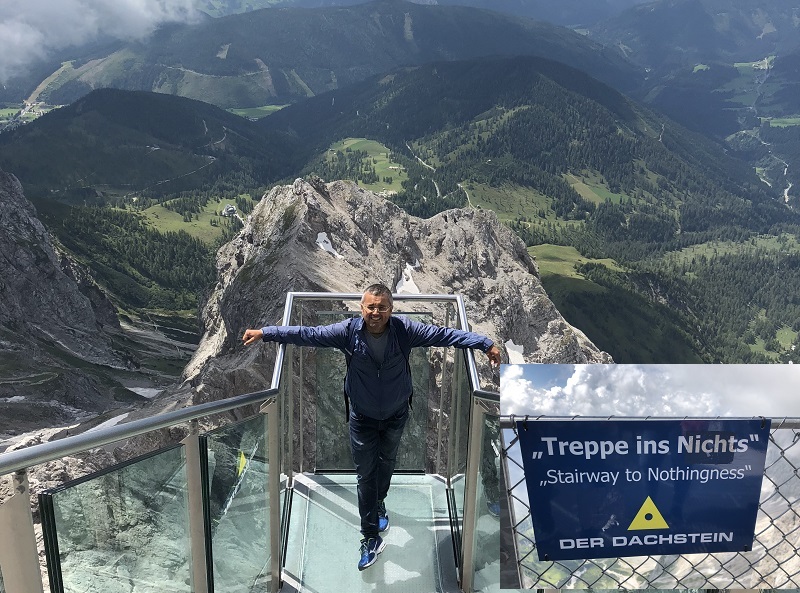 Treppe ins Nichts or Stairway to Nothingness with a great view over the Ramsau am Dachstein in the upper left corner. We also visited the Ice Palace simply to see how it is to be under 6 meters of ice. 6 meters of ice above the Ice Palace – Because of heat development it is only allowed to have 40 people inside. The ticket can be used one time only. When coming in to the Ice Palace you get informed about the fact that you have 6 meters ice above you. Also you get information about the limited number of visitors. Because of heat development it is only allowed to have 40 people inside the Ice Palace. The ticket can be used one time only. 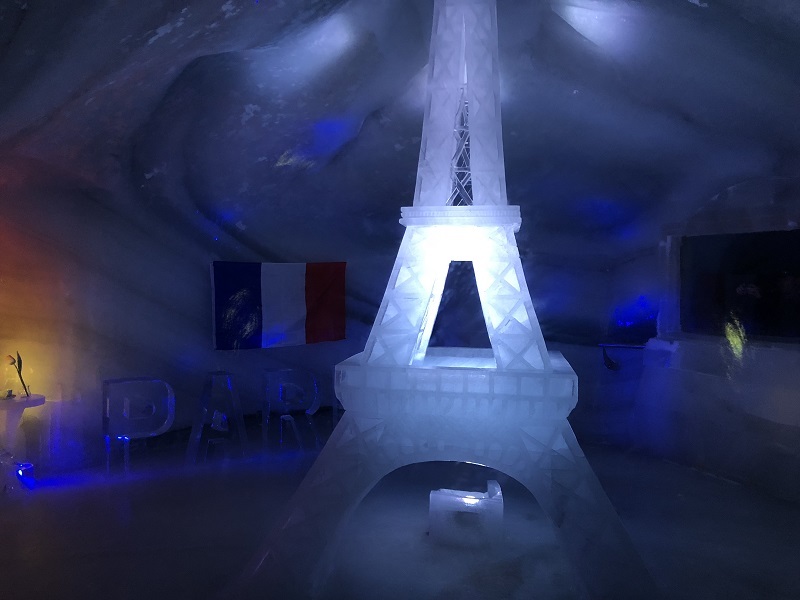 Inside the Ice Palace, under 6 meters of ice, we can see many different sculptures from different countries. One of them is the Eiffel Tower in Paris. Inside there, under the 6 meters ice we can see many different sculptures. They represent different countries. One of them is the Eiffel Tower in Paris, France. Walking around in the Ice Palace was little bit slippery and we had to be more careful than we expected. Snow, ice and cliffs is what we can see and experience on this wonderful mountain. Especially in combination with some sunny weather. 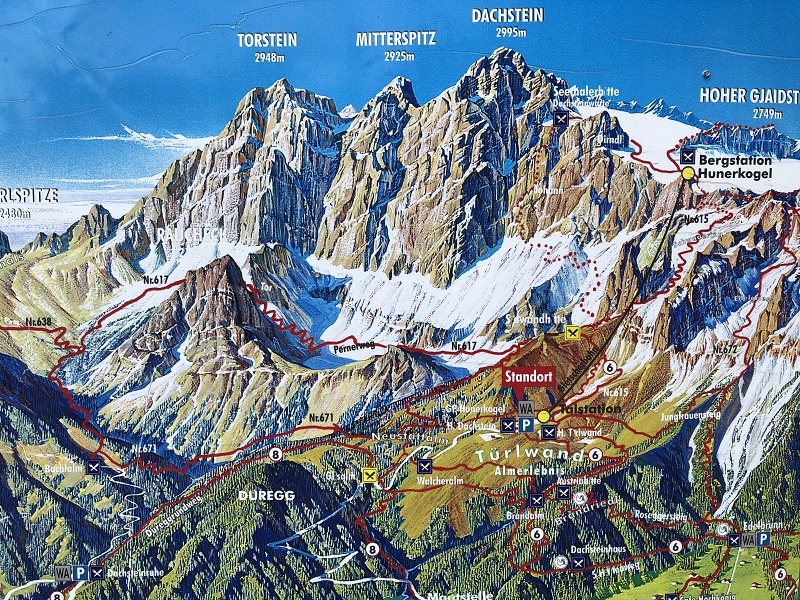 The map shows us Hoher Dachstein 2995 meters above the sea level, glacier, snow and cliffs. This fantastic place is something we experienced in 2018. 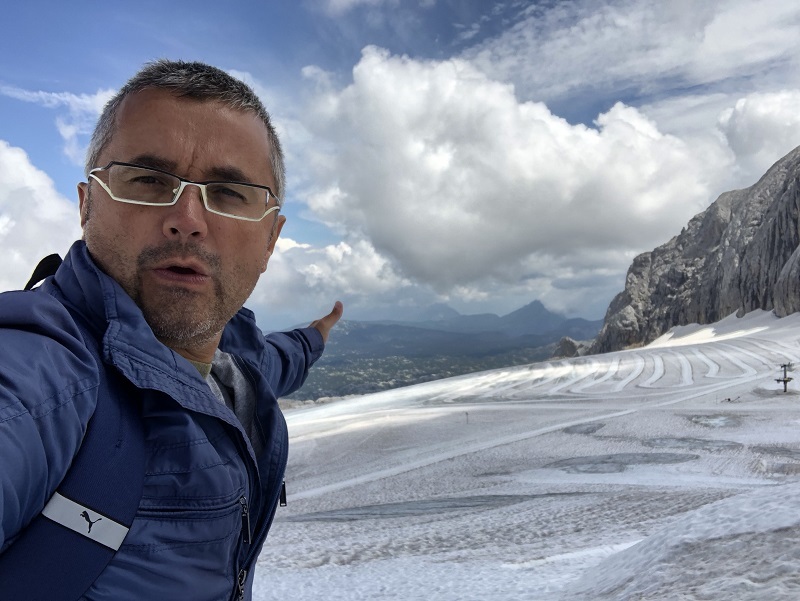 The glacier that we see all around is huge and covered by melting snow surface. Since the temperature is not so high the melting process goes very slow which means that this huge ice area always remains white until next winter and new show. The glacier that we see all around is huge and covered by melting snow. This is a perfect place for skiing and snowboard adventures close to Salzburg. The whole area is a perfect place for everyone who love mountains. Climbing on cliffs or ice but also walking upwards looks very attractive and we are sure that people love it. This is a perfect place for skiing and snowboard adventures close to Salzburg. ← Vodka Azzurra a Saturday evening?